Lightroom is an extremely powerful (although sometimes extremely slow) tool. Most of us are familiar with its great editing capabilities, but it’s true power, in my opinion, lies in its use as a photo organizer. One of the things I love about photography is there are often multiple methods by which you can achieve the same result. Organizing Lightroom is like that. 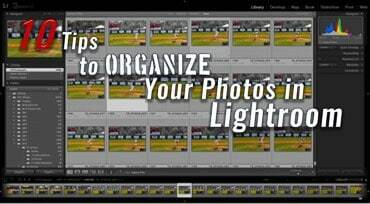 Before you start organizing, you should think about how organized do you want to keep your photos? At the very least, I recommend you designate one folder in which to keep all your photographs. It’s easier to find something in your house when you at least know what room it’s in. There’s no difference when looking for something on a computer. Generally, a hobbyist won’t have as much need for organization as a professional photographer. However, the need for organization seems to grow in proportion to the number of photographs in your library. What doesn’t look that cluttered with only a few hundred photos becomes a huge mess as the photos in your library begin to number in the tens of thousands and beyond. Because the need for organization grows, I recommend you start off more organized than you think you need to be. It’s easier to become less strict about organizing than it is to become more strict and try to correct past “mistakes.” Ultimately, though, it's your Lightroom. You know if something I suggest just won't work for you. Feel free to adapt these tips to something you can live with. 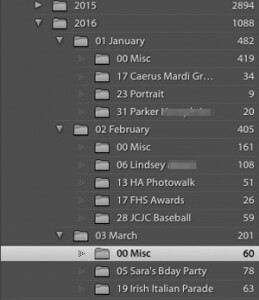 For years, Lightroom users have been told by the “old timers” that you need to have multiple catalogs. If a catalog was too large, it would supposedly slow down Lightroom. There was no consensus, however, on how large a catalog could be. Some said you needed a new catalog every 20,000 images. Some said every 100,000 images. Some said—well, you just pick a number, and somebody said you should start a new Lightroom catalog when you got to that arbitrary limit. The theory that large catalogs would speed up Lightroom has been tested, and it was found to be false. Lightroom is still slow, but it's not because of the catalog. Organizing your photos is a lot like cleaning the “junk room” in your house—you know, that room where you put stuff saying you’ll find a permanent place for it later. You’ve been doing that for years, and “later” still hasn’t happened. Your computer is your digital house. It’s where all your digital photos, music, and videos live. Chances are you have a folder (or several photos) that serve as your junk room, and you’ve been putting photos in these folders. You know what the first step is in cleaning up your house’s junk room? That’s right, STOP PUTTING STUFF IN THERE! So, the first thing you’re going to do is decide where you will put your photos from now on. If I may be so bold, may I suggest making a subfolder in your Pictures folder (I currently use a Mac; I believe Windows still calls its folder something like “My Pictures”). From this moment on, if you want a photograph to appear in Lightroom, you are going to put the photo in that designated folder. You can name it whatever you want, but for the sake of this article, I’m going to call that your Photos folder. If you are already placing your photos in a Photos folder, great. You’re a step ahead of the game. If you’re like me, you have years of digital photos stored in Lightroom. It’s probably too much to tackle all at once. So, you’re going to organize Lightroom the same way you eat an elephant—one bite at a time. 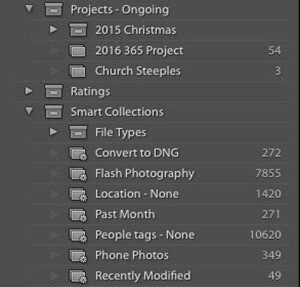 Create a folder in the root level of your folder list in Lightroom. I strongly recommend you name this new folder “! !Legacy.” What’s up with the double exclamation points? That’s so it shows up at the top of the folders list. 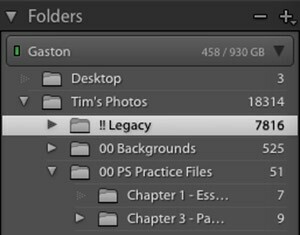 Now, inside of Lightroom, drag all your messy folders and place them inside !!Legacy. Just as an organized house makes you want to keep it organized, an organized folders list encourages you to keep the folders list organized. You can open ! !Legacy when you have time to work on your organization, but the rest of the time, you can keep it closed and your folders list will look nice and neat. All your newly imported photos will be placed according to your folder structure and as you have time, you’ll go back and organize your old photos. 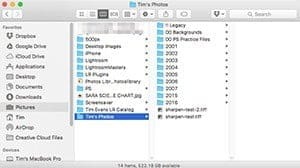 Although there are some who would say that you shouldn’t use the folders to help you find your photographs, I think an effective folder structure can make finding a photo much easier. Creating a good folder structure takes a little thought. Think about what it is you photograph. Most hobbyists, such as myself, don't really specialize in one genre of photography, so I think a date-based structure works best. However, I can see a landscape photographer creating a folder structure based on location, or a wedding photographer creating folders based on couples' names. For those wanting to follow my My structure begins with a folder for each year in the root level. Then, under each year, I have folders for the months. I precede the name of the month with a number so the months will be in calendar order. For example: 01 January, 02 February, 03 March, etc. Finally, I come to the day subfolders. Only, I don’t necessarily create a subfolder for the day on which a photo was taken. If the photo isn’t of any specific event, I put them in a subfolder I call “00 Misc” under each month. The “00” puts it at the top of the day subfolders Then, if there is any specific event that I photograph, such as a party or a paid shoot., it gets it’s own subfolder under the appropriate month. This is what works for me. Of course, you should make the structure something that works for you. The usefulness of this tip will vary wildly from person to person. If you venture much outside the Library and Develop modules of Lightroom, then collections are very helpful. If you’re like me, and 99% of your time in Lightroom is in those two modules, then you may not find them that useful. Collections, as mentioned earlier, are simply photos that are grouped together, regardless of what folder in which they are located. You can have smart collections, which are essentially saved searches for photos that meet certain criteria, and you can have regular collections, where you manually group photos together. For example, I can create a smart collection with the criteria that it only contain photos I have rated four or more stars. The smart collection continuously searches my library and gathers all the photos so rated and automatically inserts them in the collection. I can also create a regular collection, and I have to manually drag and drop photos into that collection. If I wanted to make a collection of photos with people who are wearing red shirts, I’d have to make a regular collection because Lightroom has no way to search for that criteria. Here’s why collections are great: Let’s say I want to see the photos of my children. I have a smart collection designed to collect photographs that contain the keywords for their names. So, I can go to that collection and instantly see all the photos I have taken of my children. Plus, collections are available in every module, so they’re the easiest way to group together the photos you are using to make a photo book, a set of photos you are printing, or photos for a slide show. Here’s why I think collections are not “all that.” Lightroom has some pretty good search and filtering capabilities. Because of those capabilities, I can, within a few moments, locate any photo I want out of the thousands on my hard drive. Because of the way I organize my photos, it’s very easy for me to, for example, find all photos of my daughter on the Disney World vacation from 2012. I recommend you play with collections. Make some smart collections and some regular ones. That’s the only way to determine if you’ll find them to be great or not. If you could do only one thing to make finding your photos easier, it would be adding keywords. While you can always search on values such as date and file name, keywords enable searching and filtering to go to a whole new level. 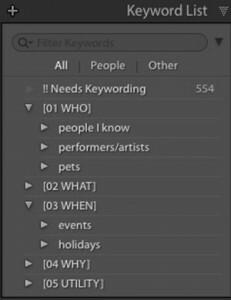 Much like folders, though, it is easy for keywords to get out of hand and become a complete mess. So my treatment of keywords is similar to my treatment of folders. I believe keywords should be arranged in a hierarchy. To me, it makes sense to start from a more general category, and then narrow it down into keywords and/or subcategories of keywords. I know some of you are going to think this is too much work, and that’s ok. 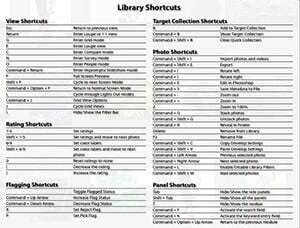 Remember, this is your Lightroom library; treat it any way you want to. Who or What – this is the subject of your photo. You may want to break this down further into family, friends, natural objects, man-made objects, etc. When – A description of the event portrayed, such as holidays, birthdays, parades, etc. Why – These keywords explain the action in the photo. Examples include swimming, playing, painting, celebrating, etc. Of course, not every photo will have keywords in all of those categories. Depending on how organized you want to be, you may also want to create categories for things such as genre (portraits, sports photography), composition (low perspective, rule of odds), and featured colors. A stock photographer may want to create keywords for concepts such as emotions, family relationships, and occupation portrayed. It’s all up to you. I didn’t include “where” in my keywords. While it’s certainly a valid choice to create a keyword category to describe where the photo was taken, location has its own metadata field. So why reinvent the wheel? I choose to use the location field rather than create another keyword category. The advantage of using the metadata is that you can even break locations down into sublocations. So, a photograph that has been tagged “New Orleans” can be tagged even further down into “French Quarter” for example. 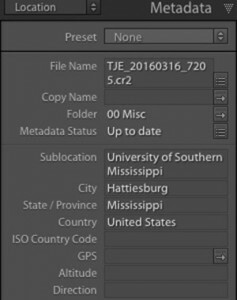 Location metadata can be accessed through the drop-down menu in the metadata panel of the library module. As discussed later, you can create presets for your often-used locations. You can go even further with geotagging your photos and having that correspond to certain locations, but that’s outside the scope of this article. Not organizing, per se, but I think your library will look much neater if you have a standard naming system rather than “Img 0351” or whatever your camera names its files. You can create a naming preset so that your photos will be automatically renamed while importing. When most people think of presets in Lightroom, they think of settings in the develop module. But there's another kind of preset—the metadata preset. Metadata presets make it easier to keep your photos organized by filling in several metadata fields at once. 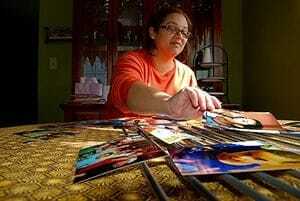 If you make an activity, such as organizing your photos, easier, you are more likely to continue to do it. 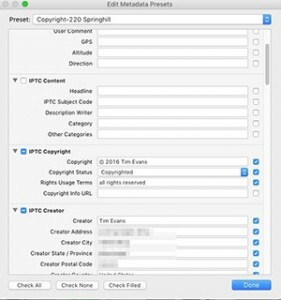 You can make presets for all sorts of metadata, including location, creator, and copyright, just to name a few. You can be as specific as you want to be. For example, I have presets that just add copyright information and other presets that include both copyright and creator information, as well as location information for my most frequent places to photograph, such as my home and my children’s schools. It's easy enough to make metadata presets. You simply go to the menu, and select Metadata>Set Metadata Presets. . . . Then, fill in the fields you want included in your presets. Make sure you check the box to the right of any fields you want displayed. (If you want to purposely keep a field blank, such as your address, then you need to leave the field blank, but check the box). You can designate which preset to use when importing your photos. Then, the photos will enter your library with some important metadata already completed. This has nothing to do with organizing, but it’s my number one tip for Lightroom users (or photoshop, for that matter). 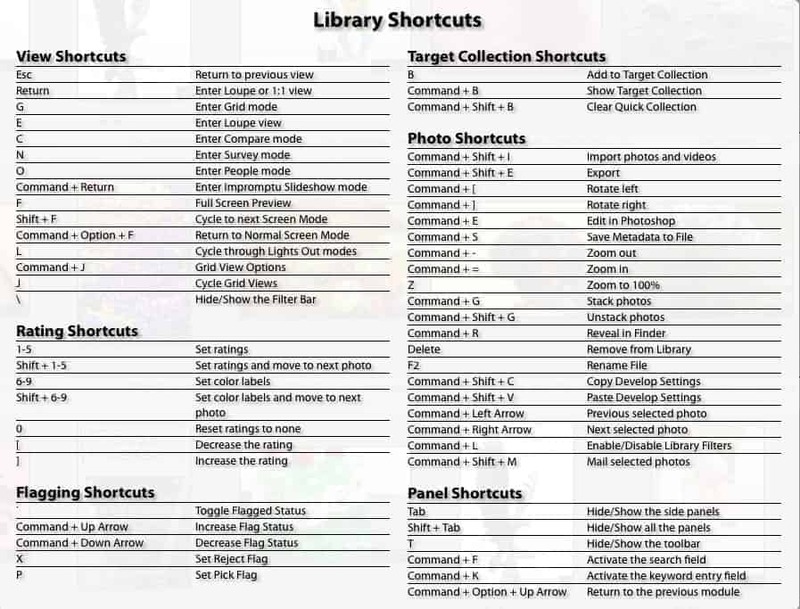 Just about every command has a keyboard shortcut. If you learn those shortcuts, it will speed up your post-processing. It may not seem like much but the difference in the time it takes to hit a couple of keys versus navigating with a mouse really adds up. In Lightroom, simply press command (or control on a PC) and the / key at the same time. This will pop open a window displaying the most commonly used shortcuts for the module you are in at the time. 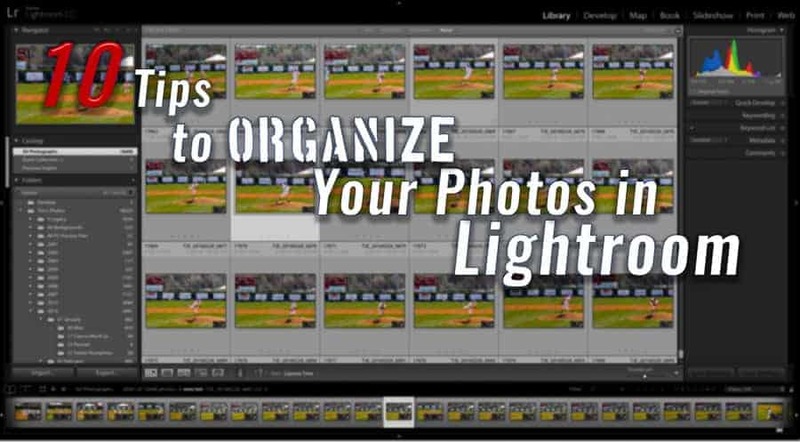 I hope you now have a better idea how to use Lightroom to organize your photos. You should consider these tips simply as guidelines. To make an organization system you’ll stick with, you need to design the system to be right for you. If you use the point in this article as a starting point, you’ll have your system complete in no time. Tim Evans is a lawyer in Hattiesburg, Mississippi. He has loved photography ever since getting a Bugs Bunny instamatic camera at the age of seven, but it wasn't until 2013 that Tim got a DSLR and began learning to better his photography. When not behind a camera, you can probably find him in his kitchen, trying to perfect his chicken and sausage gumbo. Check out his website here. You can find him on Flickr at https://www.flickr.com/photos/evanstj/ and at 500px at https://500px.com/timothyevans1.